It didn't take much effort for the accused gunman in Tucson's Jan. 8 mass shooting to buy a semiautomatic handgun and ammunition - quick trips to the Sportsman's Warehouse and Walmart near his home. It didn't take long - 15 seconds - for him to shoot 19 people, killing six, when he fired 31 rounds using a high-capacity magazine. That's roughly double the standard number for the Glock pistol he used. And even if police could go back in time, they wouldn't have been able to arrest him until the moment he pulled out his pistol and pointed it at U.S. Rep. Gabrielle Giffords. Before then he hadn't violated any state or federal gun laws. "Arizona's lack of gun laws makes it far too easy for dangerous people like the Tucson shooter to get dangerous weapons," said Brian Malte, spokesman for the Brady Campaign to Prevent Gun Violence. But don't expect Arizona to tighten regulations in the wake of the shootings. On the contrary, numerous bills in the Legislature this year, many introduced since the Jan. 8 shootings, would loosen regulations on the possession and use of firearms. One proposed law, introduced a month after the apparently mentally ill Jared Lee Loughner was charged in connection with the shootings, would have made it easier for people previously judged mentally ill to win back their right to own firearms. Another proposed law would make Arizona the second state to let people with concealed-carry permits take guns onto college campuses. Gun-rights groups argue the Legislature should make it easier for all qualified Arizonans to have guns. That, they say, is the best way to prevent future mass shootings - an armed citizenry could pull out its own guns in the face of violence and, if necessary, shoot back. "My vision is that criminals fear the armed citizen, and the public doesn't," said Tucsonan Charles Heller, co-founder and secretary of the Arizona Citizens Defense League. • How could a person with apparently serious mental problems so easily buy a semiautomatic pistol and an extended ammunition magazine - and carry it legally without a permit? • If just one person in the crowd waiting to speak with Rep. Gabrielle Giffords were armed, could he have cut the rampage short? Tucsonan Joe Zamudio was at Walgreens Jan. 8, deciding whether to buy one or two packs of cigarettes, when he heard a rapid "pop-pop-pop-pop-pop" sound. He ran outside, but the gunshots had stopped. He saw people wrestling with a man on the ground - and then he saw a man with a gun, and heard him say he would kill somebody. "That's what scared me," he said. With a hand on the Ruger 9 mm pistol inside his coat, he rushed over and noticed a key detail about the pistol the man was holding. "The slide was locked back," said Zamudio, who was raised around guns. "He was holding a gun that was basically not dangerous." Zamudio didn't know if that man was the shooter, but he grabbed his wrist and ordered him to drop the gun. It turns out the man and others had pushed the shooter to the ground and wrestled his gun away. Zamudio never pulled out his own gun. "He's just an honest guy with a gun in his pocket," Heller said of Zamudio. "He had a shoot/no shoot decision and he made the right decision. He's the norm." Zamudio has considered what would have happened had he walked over to check out the crowd in front of the Safeway that morning. "I might have been standing right there," he said, "and I might have been able to stop him." What gun-rights groups see as an example, gun-control groups see as a near-disaster, shuddering at what could have happened had Zamudio or another armed bystander opened fire. "They want to claim that Zamudio's actions, which amount only to narrowly averting another death, is somehow a success?" asked Kristen Rand, legislative director for the Violence Policy Center, a Washington, D.C.-based nonprofit group that works to reduce firearms violence in the U.S. "How did his presence improve the situation in any way?" Gun-rights groups' vision of an armed society is a fantasy, Rand said; guns are not always used correctly, especially in high-stress, chaotic situations such as mass shootings. In the 18 shootings nationwide since May 2007 where three or more people have been killed by people carrying concealed handguns, none was stopped by a legal handgun carrier, she said. "The pro-gun policy put the gun in the hands of Loughner as well as Zamudio," she said. Arizona ranked seventh in the country for its rate of gun deaths in 2006 and 2007, the most recent years data are available from the Centers for Disease Control and Prevention. It had 15 gun deaths per 100,000 people in 2007, more than the national average of 11. The Jan. 8 shooting didn't expose any single flaw in U.S. or Arizona gun laws, but rather a fundamental problem with our country's gun culture, said Garen Wintemute, director of the Violence Prevention Research Program at the University of California-Davis. "In a society where a wide variety of firearms are available to pretty much anybody," Wintemute said, "it's inevitable that such events will occur at some place and some time." Protecting the right to have firearms as a fundamental freedom is something Arizona does right, state Sen. Frank Antenori said. Something it does wrong, he said, is failing to keep potentially violent, mentally ill people from owning firearms. To correct that, he's supporting a bipartisan bill that would create a state database of people who have experienced "a significant or severe psychological episode." Schools and colleges would be required to report such incidents to the database for the purpose of enforcing gun laws. There is a federal list of people barred from owning guns for various reasons including mental illness. But fewer than half of states are complying with a law enacted after the 2007 Virginia Tech massacre that requires them to report to the national background-check system the names of people judged mentally incompetent or committed for mental-health treatment. From 2008 through August 2010, Arizona submitted 4,465 names to the database, Department of Justice data show. But the database should include nearly 122,00 Arizonans, the data show. Tucsonan Gracie Verduzco, a paranoid schizophrenic, was able to buy a gun from a Tucson pawn shop before she went on a May 21, 1998, shooting spree around Tucson that wounded four people and killed one. Although she had been recently released from a mental hospital, her name had not been reported to the National Instant Criminal Background Check System, or NICS, database. A state law proposed by the Arizona Criminal Justice Commission would have updated the state's process for people previously judged mentally ill to restore their right to firearms. Had it passed, the U.S. Justice Department would have awarded the commission nearly $700,000 to help it improve the state's reporting to the NICS database, said Mary Marshall, the commission's spokeswoman. But Rep. Jack Harper did not introduce the proposal as written, instead making a small but crucial change requested by the National Rifle Association, Marshall said: As introduced, the bill (HB 2563) would have made it easier for mentally ill people to get their gun rights restored. The commission ended up opposing the bill they initiated, and it has apparently died. Neither Harper nor the NRA answered requests for comment. "The basic ideas here were right: People with criminal records and people with severe mental-health history shouldn't have firearms," UA law professor Gabriel "Jack" Chin said. But gun laws targeting people with mental illness may do more harm than good, medical sociologist and Duke University professor Jeffrey Swanson co-wrote in the July 2010 edition of Psychiatric Services. They could deter people from seeking treatment for fear of losing the right to possess a firearm and reinforcing stigma, the article said. Arizona's gun culture is entrenched. Beyond the U.S. Constitution's Second Amendment, Article 2 Section 26 of Arizona's Constitution also protects gun rights: "The right of the individual citizen to bear arms in defense of himself or the state shall not be impaired." 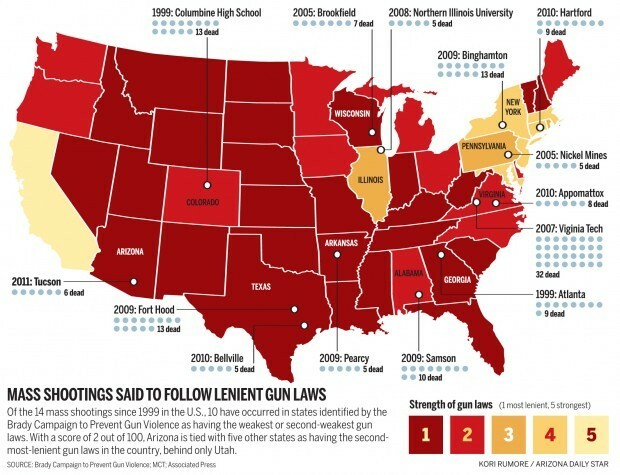 The Brady campaign ranks Arizona as the state with the second-loosest gun laws, behind only Utah. Still, the state isn't as awash in guns as some might expect. In a 2004 survey by the Centers for Disease Control and Prevention, 32 percent of Arizonans said they had firearms in or around their home, a result consistent with two earlier surveys. That was 38th among the 50 states; higher than California but lower than Nevada, New Mexico and Utah. The CDC hasn't asked this question on the survey since because of a lack of funding. Also, Arizonans may not be as pro-gun as generally assumed. Surveys taken over the last decade show a minority of state residents have guns, and a majority favor gun-control measures. "I've consistently found that about 60 percent of the people in Arizona are favorable of some sort of gun control," said longtime Arizona pollster Bruce Merrill. Polls have also shown that strong majorities oppose certain expansions of gun rights, such as allowing people with concealed-carry permits to carry guns on college campuses or in bars. A 2008 KAET-ASU poll found 73 percent of registered Arizona voters opposed allowing people with concealed-carry permits to carry guns on school grounds or campuses, a proposal that has been revived this year. Even after the Jan. 8 shooting rampage, the expansion of gun rights has remained a priority this legislative session. "Gun advocates in my district are vocal, engaged, active and they vote," said Rep. Vic Williams, who represents the area where the shootings occurred. Also, the National Rifle Association and other gun-rights groups have sway that is unmatched in the Legislature even by law-enforcement groups. Politicians are too fearful of the gun lobby's power to change long-standing laws, said Wintemute, of the Violence Prevention Research Program. From 1990 to 2010, gun-rights proponents made $24 million in political donations to federal candidates, shows data from the Center for Responsive Politics. During that same period, gun-control proponents gave $1.8 million to federal candidates, the center found. "We live in a political system," Wintemute said, "where decisions are driven by money." In its latest campaign-finance report for Arizona, the NRA Political Victory Fund reported spending $139,282 on ads supporting Gov. Jan Brewer's campaign last year. In December 2009, the fund donated $4,815 to 24 candidates for the Arizona Legislature, though a filing made last month said $1,560 of it was returned by the campaigns. While the contributions were relatively small - $300 for Antenori's campaign, for example - they were much larger than contributions made by gun-control groups. "We contribute no money whatsoever," said Hildy Saizow, president of Arizonans for Gun Safety. In the 2010 election cycle, Sen. John McCain, R-Ariz., received the sixth-most money among federal lawmakers from gun-rights proponents, with $27,100. In the 2008 election cycle, when McCain was running for president, he received $452,215. That was nearly eight times the money contributed for gun control and five times more than any other federal legislator. McCain said he wouldn't change gun laws in the wake of the Jan. 8 shootings. The likelihood of mass shootings "doesn't seem to be driven by what kind of gun laws there are," McCain said. "It seems to be driven by the mental state of the individual." He doesn't favor limits on the amounts of rounds in magazines, either, which is gaining traction at the federal level. The latest to back the idea is Dallas Green, grandfather of 9-year-old shooting victim Christina-Taylor Green. He said last week that though he's a hunter who loves his guns, he doesn't understand why semiautomatic pistols with magazines holding 33 rounds are sold. In the 1990s, the Center for Injury Prevention at the CDC in Atlanta financed studies of gun injuries and deaths as a public-health issue, said Dr. Mark Rosenberg, who directed the injury center at the time. But the NRA and its allies in Congress attacked the studies as politically slanted, so the studies never determined what works best to keep guns out of the hands of mentally ill people and criminals, Rosenberg said. "We left Gabby Giffords defenseless, Rosenberg said, "not knowing what works and what doesn't work."